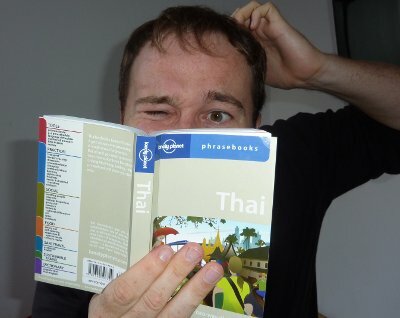 Does your Thai girlfriend really want you to learn to speak Thai? This is a very interesting topic for discussion. Here is an example of when it may well of been beneficial to speak Thai. A British guy was sat at a beer bar in Pattaya with his Thai girlfriend. She had been asking for money from her boyfriend for her sister, who she says has had a motorcycle accident and is in hospital. She needs money to pay for treatment. 2 other foreigners in the bar immediately sense a fleecing is in progress. The Brit hands over 10,000 Baht and asks is it enough? She asks for 5,000 more, and he hands it over. She is very happy and shows her display of love and gratitude. She then announces that she needs to call her sister so she not worry no more….So she calls her ‘sister’ on her iPhone 5s and everyone is happy. The guy then rings the bell, the whole bar is now happy including the 2 guys who have been listening in. One asks the other “Do you think her sister has had an accident and needs money?” The other chap replies “I’m at an unfair disadvantage in that I speak Thai rather well. The guy’s girlfriend was talking with her Thai boyfriend, maybe husband. She told him that they can buy the new TV tomorrow and she has got enough money from the stupid farang to get the big one they saw in the shop near the hospital. She probably threw in the Thai for hospital to justify her scam, or just in case the boyfriend knew the Thai for hospital!” In this scenario the Thai girlfriend definitely would not want her foreign boyfriend to speak Thai. Are all Thai ladies like this? Well no, of course not. But, you have to ask yourself where did you meet your Thai girlfriend? If she was a bar girl then there is a much higher risk that she is just seeing you for your money. Often girls who work in bars have Thai boyfriends and sometimes husbands as well as many ‘customers’. A nightclub photographer recently reported that many Thai girls in the clubs don’t want their photos taken for Facebook because their foreign sponsors will see them in a club when they said they were visiting relatives and so on! You could just ask your Thai girlfriend “Do you want me to learn Thai?” If see appears nervous or says “No, I want you speak me English better” you know something could be wrong… Alternatively you could learn Thai and not tell her. This is rather crafty, however, it might give you a different insight into what your girlfriend talks about on the phone and to her friends! There are different levels of Thai as well as it being a tonal language. How the bargirls speak to each other is not the same as polite hi-so Thai chit chat in a Bangkok coffee shop! Obviously there are some words that both camps use, but remember if you learn Thai from a bargirl, you will sound like a bargirl in polite company. So does your Thai girlfriend want you to speak Thai? It really depends on if she is using the language barrier to hide things from you or not. If she is a nice, well-educated lady she will not like it if you speak Thai like a bargirl that could also be a good reason for wanting you to speak only English!